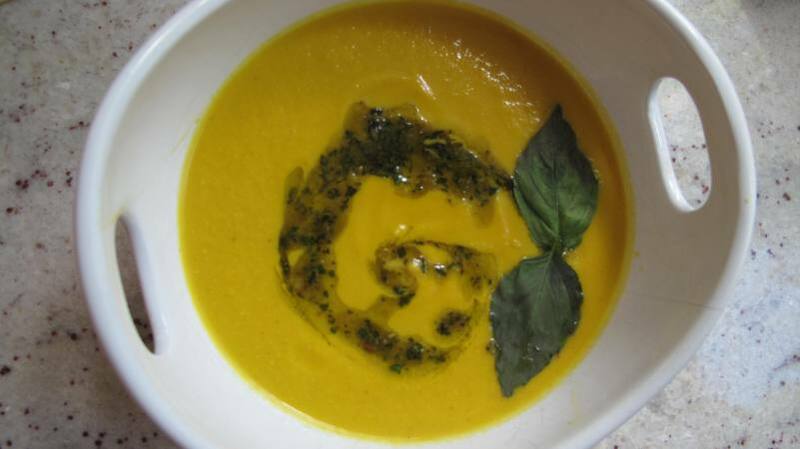 Carrot Ginger Cashew Bisque with vegan pesto and basil leaves. If the eyes are the windows of the soul, then this soup is soul food. Packed with beta carotene, turmeric, and healthy fats and proteins, this soup is wonderful for your eye and gut health. I had a similar soup during my yoga therapy training at Mount Madonna Center, so I'm flooded with happy memories every time I taste it. It may be served warm or chilled, and is delightful when accompanied by pesto, fresh herbs, creme fraiche, or by itself. Hope you enjoy. *Denotes optional ingredients. Onions and garlic disagree with some folks’ digestion, so you can leave them out for a different flavor. Heat the ghee in a medium/large stock pot. Add onion and garlic and cook over medium heat until translucent and fragrant. Add carrots, salt, and spices. Lower the heat and continue to sauté for another 8-10 minutes. Add the water/broth and bring to a low boil. Allow to simmer until the carrots are tender (10-15 minutes). Use a blender to puree the mixture until smooth. Add cashews to the mixture and puree until creamy. Carrots: Carrots are well known for their rich supply of the antioxidant nutrient, beta-carotene, which is GREAT for our eye health. However, these root vegetables are also a great source of a variety of antioxidants and other health-supporting nutrients such as vitamins A, C, and K. Studies have shown their effectiveness in the prevention of colon cancer, and their benefits to our cardiovascular health. See here for more health benefits and nutritional information. Cashews: Cashews have a lower fat content than most other nuts, and approximately 75% of their fat is unsaturated fatty acids. What's more is that about 75% of this unsaturated fatty acid content is oleic acid, the same monounsaturated or "good fat" found in olive oil. This super nut is also packed with copper, manganese, magnesium, and tryptophan (the "feel good" amino acid"). See here for more health benefits and nutritional information.